Usually we think that business is just for making money. But if you will look at the other side of the coin, what it is all about is “creating value”. Haven’t you asked yourself why businesses survive or still exist? that is because it provides value to the owner and to it’s customers. Just in case you have a business, the better you know what value you are trying to provide to your customers, the better you will be able to focus. Lets not go far to give you an example what I’m trying to explain. Even a simple blog I like this can be a better example. This blog provides value to it’s readers by getting information that they are looking for. Although I don’t have the answers to everything and I’m not the jack of all trades, I provide information from other sources and put it in this blog. I promote this blog using SEO (search engine optimization) and social networking so people will flock to this site and make it as a reference. I’m not an expert on entrepreneurship but I search information to help budding entrepreneurs and maybe those who were already established entrepreneurs. Not only that, those who already have businesses can share their experiences or post their business information so that other people will know they exist or they have products or services to provide. So that is is a lot of value if you will ask me. 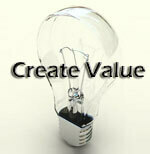 Too often many businesses are not aware on what value they are giving to their customers. They just sell stuffs and only thinks of profit. I think that is not a very sustainable business and in the long run owners will loose enthusiasm and will feel like a hamster on a treadmill. Oh! today is another day….sigh….not very exciting perhaps. In my honest opinion the world always needs genuine value creation and that is where we should direct our efforts. So how about you? have you focused your attention on the kind of value you are trying to provide? Please share your thoughts!